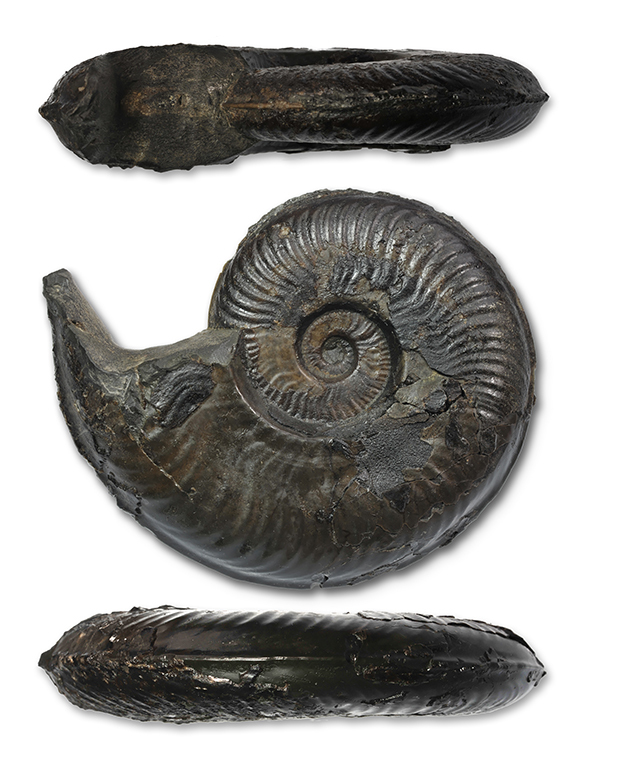 Aperture, front and keel view for macroconch of Eleganticeras elegantulum (YOUNG & BIRD, 1822). At 10.5 cm this is close to the average size for macroconches. 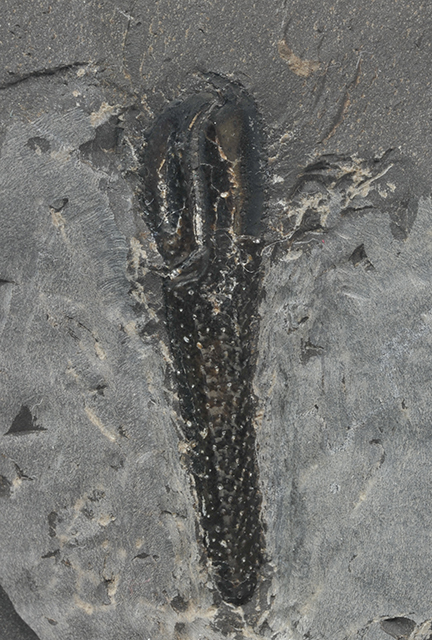 The ribbing is relatively strong on this specimen, it came from a large Cannonball nodule at Hawsker Bottoms. I’ve recently leafed through the 1981 english edition of Ulrich Lehmann’s book “Ammoniten – Ihr Leben und ihre Umwelt” (“The ammonites – Their life and their world”). 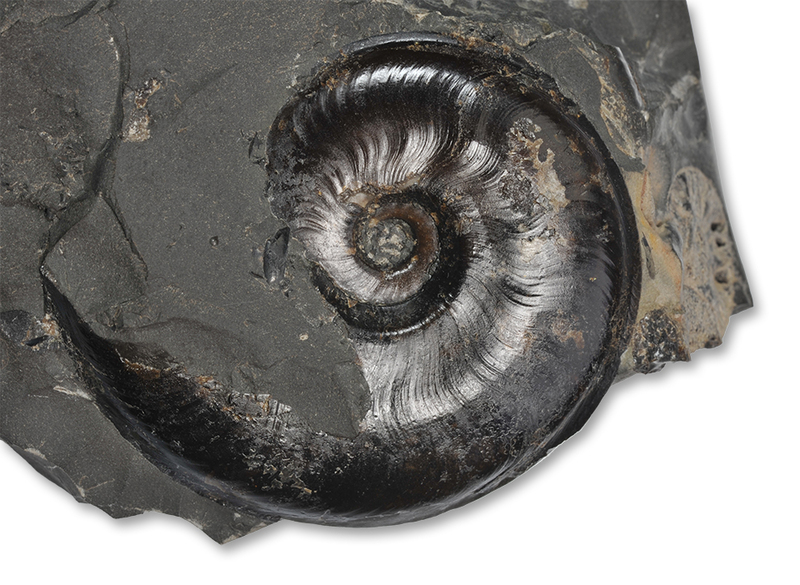 Lehmann describes in the foreword how the book came to be in the making of an ammonite exhibition in the Hamburg “Geological-Palaeontological Institute” at which he was a Professor for Palaeontology. Reading the foreword brought back long forgotten memories of this exhibition – Hamburg is the town where I was born, and I remember a visit to the exhibition and how in awe I was seeing nodules not unlike the Cannonball nodules off the Yorkshire coast (which I did not know then) with dense accumulations of Eleganticeras, but differing in their shell being preserved in a pearly white instead of black. 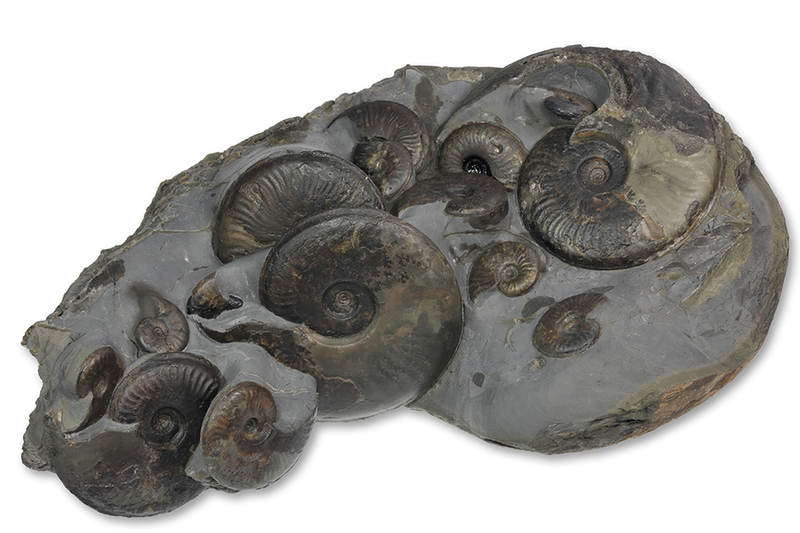 The original german version of the book is from 1976, so I must have been between 10 – 13 when visiting the exhibition, and it was the first time I got into contact with ammonites – and they´ve kept me fascinated ever since ! Lehmann had been studying Eleganticeras from glacial drift exposures close to Hamburg at Ahrensburg that contained upper toarcian limestone nodules. The origin of these nodules is assumed to be the somewhere west of the south swedish coast. Lehmann is widely credited as being the first to describe the sexual dimorphism of Eleganticeras, i.e. the recognition of female (macroconch) and male (microconch) shells within the context of the same species. Howarth very nicely statistically reproduced this for the Yorkshire population of Eleganticeras in his 1992 Palaeontographical Society publication of “The Ammonite Family Hildoceratidae in the Lower Jurassic of Britain”, taking into account at total of 392 (227 macroconchs and 165 microconchs) specimen from 6 localities on the Yorkshire coast. A size comparison between a 140 mm macroconch and a 30 mm microconch (positioned for this photograph on the body chamber of the macroconch) of Eleganticeras elegantulum. It is an essentially unprovable but very likely extrapolation from some living cephalopods that the Microconch (male) is very often significantly smaller than the Macroconch(female) of the species. This argument is also underpinned by the discovery of a likely egg sac in the body chamber of a macroconch Eleganticeras. The adult male microconch can be recognized by the constriction at the mouth border and is with max. about 30 mm very much smaller than the female macroconch with max. about 150 mm . 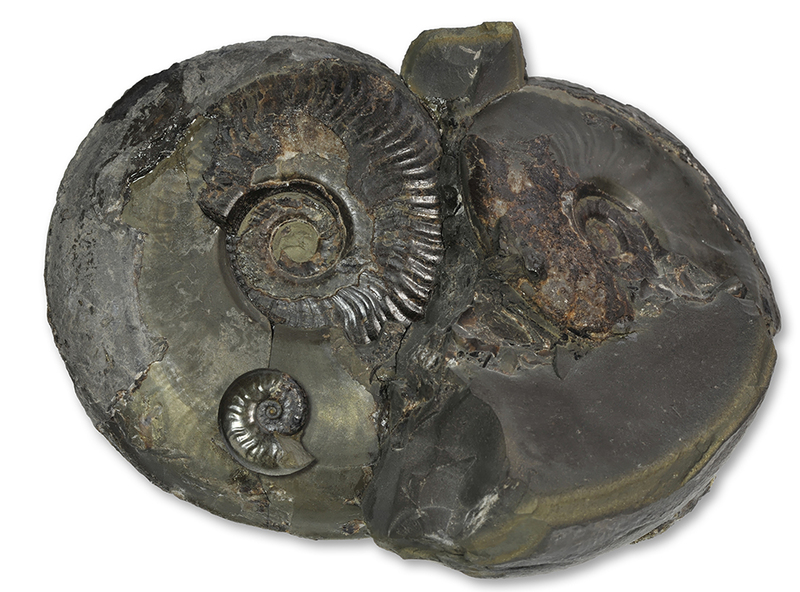 As mentioned above, the best preserved Yorkshire 3D Eleganticeras specimen occur in the so-called “Cannonball” nodules of the Jet Rock, falciferum zone, exaratum subzone, beds 33 and 34 of the upper toarcian. “Cannonball” is a very fitting name for these nodules, since they’re often very round nodules and they’re also very hard – their outer layer consists mostly of pure pyrite and they are tough package to crack – even sometimes sending off sparks when hit with the hammer’s steel. This nodule was found below a pile of shale from a small fresh fall in July 2012 at Hawsker Bottoms. 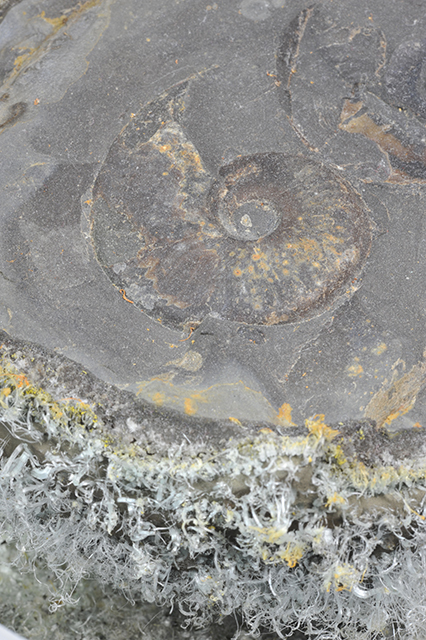 It looks like another collector had already tried to open the nodule, since the top part was missing and showed some sections of larger and smaller Ammonites. Fast forward 9 months later, I visited Mike again, to pick up some fossils which I had bought from him. 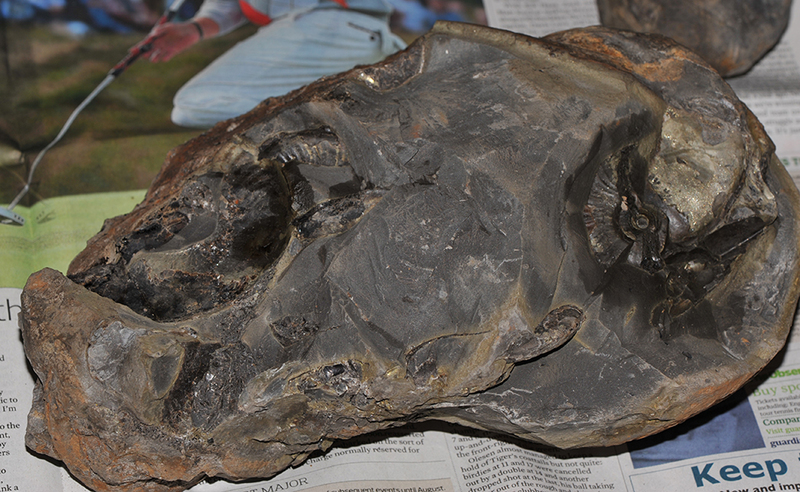 The same nodule masterfully prepared by Mike Marshall containing 16 ammonites between 2 and 10 cm. No less than 16 microconch and macroconch shells of Eleganticeras are contained in this nodule, ranging from 2 to 10 cm – you can imagine how pleased I was both with my find and the superb work Mike had done on it ! As tough as these nodules are when they are fresh, nothing lasts forever, and especially when the nodules are exposed for a longer time to the forces of breaking saltwater waves and being rubbed against other rocks in the surf, the pyrite skins are prone to decay through pyrite rot – the following picture shows the skin of a nodule almost violently erupting dense bushels of hairy gypsum crystalls and reducing the pyrite to a yellow-white powder in the process. but with lots of appeal to the collector.